Although they are often lumped into the same category, hybrid and electric cars differ substantially. While both types of designs offer some advantages over internal combustion designs, choosing the right option for you and your family will require substantial research. Here are some of the similarities and differences between these two types of cars. Electric cars are relatively simple. A set of batteries is charged, and this energy is used to drive simple electric motors. When the car is not being used, it is plugged in to ensure that the batteries are capable of functioning when they are needed. Electric cars have been around for decades, but battery technology has limited their usefulness. Modern electric cars often have a range of only 40 or 50 miles. For daily commutes, this is often more than enough; for road trips, however, more mileage is necessary. Hybrid cars are essentially standard cars with a small set of batteries and a small electric motor. Cars generate a tremendous amount of heat during standard operation; brakes, for example, convert forward momentum into heat to slow vehicles. By harnessing energy that would otherwise be turned into heat, hybrid cars are able to charge their batteries. Hybrid cars have a relatively low range when operating on their electrical motors, but they have comparable ranges to standard cars thanks to their gasoline engines. Because of this, hybrid cars are considered more practical than electric cars. Will Electric Cars Save Money? Energy rates vary throughout the country. For example, Bounce Energy rates vary based on which state you live in. However, electricity prices are always cheaper than gasoline and diesel. While electric cars cost more up front, they will allow drivers to save money that would be spent on fuel. Current battery technology, however, is still relatively limited, and some believe that the batteries used in electric cars will need to be replaced sooner than manufacturers' claim. If this is the case, the total cost of ownership for an electric car may be significantly higher than that of a standard vehicle. Will Hybrid Cars Save Money? Hybrid cars get better mileage than comparable non-hybrid cars. In addition, their smaller batteries are often able to last much longer than the large battery sets used in electric cars. As a result, most hybrid car owners will save a significant amount of money over time. In addition, hybrid technology is improving, and it is expected to become more popular in the future. This will help lower the initial cost of hybrid cars and allow drivers to avoid the premiums currently incurred when buying modern hybrid vehicles. It is difficult to predict whether electric cars will become standard in the future. If batteries improved dramatically, however, the advantages of electric cars will make them the smart choice for most drivers. Batteries that can charge quickly can help make the difference, but many experts still believe that the future of driving lies in hydrogen. If you're a fan of alternative energy and specifically electric vehicles you no doubt have a love-hate relationship with all of the features on the latest and greatest breakthroughs in EV technology. Every month, it seems, there is an article or press release with promises of an EV future just out of reach. A new car is forthcoming, in prototype...a revolutionary, improved battery technology has been discovered in the lab that will allow x number of many miles more than now at much cheaper prices. We've certainly seen the hype and, here at Prognog, we may even be a little guilty of spreading the news. And why not? There's certainly nothing wrong with seeing what companies are working on or researchers are discovering. The key, of course, is recognizing vaporware for the real thing. From being able to distinguish a realistic product from something that will never see the light of day. We covered the futuristic-looking Aptera for quite awhile, hoping it would finally hit production...only to be disappointed once again when it failed to materialize. Certain technologies are just not ready for prime time. They are simply too good to be true at this point, even if they do offer us a nice glimpse into a future possiblity. On the other hand, there are companies, notably large auto manufacturers, that are producing electric vehicles with no real intent to produce in any kind of large numbers. Call them "compliance cars," if you'd like. In fact, Green Car Reports has done just that in a nice feature article enumerating the different car companies that have actually produce a viable model (ie Nissan, Mitsubishi, Coda, etc.) and those that are just making cars that are "only built to meet California regulations for zero-emission vehicles--which is why they're called "compliance cars." This is an important difference to note--that is pointing out those cars that are not really produced with any proper intent. When consumers, especially those leery of electric vehicles to begin with, see low-quality cars quickly thrown together with nearly non-existent sales, their skepticism is only reaffirmed and amplified. Ultimately, these compliance cars do a great disservice to the future of electric vehicle production. Cars - There are measures you can pick up to make your driving as energy efficient as possible. This will not only help the environment, but also save you some money too. By driving economically you will less likely need to call upon your RAC Car Insurance, because you won't be over driving your car. measured breaking and pacing your journey causes less emissions and means less trips to the mechanic. Electrics - switching off lights and electrical appliances when you leave a room, makes all the difference. You hardly need it on if you aren't in the room. Turn them off or power down your laptop when finished with it etc. Your wallet will be heavier too for your trouble. Air conditioning - On a hot night the temptation to use the air conditioning is strong. Why not just switch off electrical appliances. They generate unnecessary heat that can make your room stuffier. It won't make a massive difference, but you have a cold shower for the rest. Standby - Leaving your TV on standby, wastes 50% of the energy used when it is on. That energy could be better used elsewhere. Insulation - Save money by installing proper insulation for your walls and roof. This will also help your carbon footprint. Most of your heat is lost through walls. Perhaps cavity insulation would benefit your mission to save energy. It will keep the heat on the inside. Tesla Motors Inc (NASDAQ: TSLA) has been a lightning rod of controversy from its beginning, to say the least, and discussion concerning its stock, TSLA, is no different. Those folks interested in the company, or more specifically the Tesla Roadster (or perhaps more generally electric cars) find themselves asking whether they should buy Tesla stock. Is the stock a good value at this point and a great time to get in on the ground floor? Or, is Tesla grossly overrated and the stock destined to plunge into a free fall any moment? Tesla's rather unlikely ascent and early success is rather well covered. Their iconic sports car, the Tesla Roadster, has been the poster child for all EV car enthusiasts and their history does not need repeating here. The company has only been around a short while, but it feels like it has weathered the initial storms that battered it since about 2006, though it is by no means in the clear yet. Read more: Is Tesla Motors a Good Stock to Buy? Electric vehicles (EV) are in the news on a daily basis, globally as well as locally--featured in articles in local, nightly news reports as well as national glossy magazines. Everyday you can find that another company is set to release an electric car this year or a young startup has discovered some groundbreaking technology that will suddenly change the industry. It's becoming more and more difficult to understand if this is simply electric vehicle hype or if we are witnessing an EV Revolution that is a clear and distinct paradigm shift, marking move away from gasoline powered vehicles to those powered by electricity. It's helpful at this point to perform an electric car survey of the various car companies--both new and old--to see what is perhaps going to be released in the next year or so. The mix essentially contains established, larger auto manufacturers like Toyota, Nissan and GM with a large development budget and plenty of resources and those smaller upstarts like Tesla, Fisker and Aptera who are struggling to find a legitimate place at the table. All parties are ultimately fighting for what is currently a rather limited, but seemingly growing, electric vehicle market. Renewable Energy firm Harvest Power has recently raised $51.7 million in a Series B clean tech funding round from a host of venture capital firms led by Generation Investment Management, a company co-founded by Al Gore. Harvest Power, based out of Waltham, Mass., processes organic matter such as yard waste and discarded food to produce methane, which can then be used as a fuel for generating electricity. The company has plans to build two new facilities in Canada, one of which Harvest has already broken ground on. This renewable energy facility, outside of Vancouver, will become North America’s first commercial-scale high solids anaerobic digestion facility. In addition to producing methane, Harvest Power can generate fertilizer in the process as well as compressing the natural gas for transportation purposes. In fact, the company hopes to use the new green tech funding to also add new renewable energy technologies. One of which would utilize a high temperature process to make synthesis gas, or Syngas. The by-product can then be used to generate electricity, automotive fuels and additional chemical products. Will High Gas Prices Affect the Demand for Electric Cars? As gas prices continue to rise, interest in alternatives to gasoline powered vehicles, notably electric cars, draws more and more attention. Does this strong interest, however, translate into an increased interest in demand for electric vehicles? It's obviously the case that high prices at the pump draw more attention to alternative fuel choices, as well as other options such as bicycling and public transportation. Suddenly, there is a feeling of urgency in the air, as if car manufacturers can't get their fuel efficient cars out quickly enough and everyone needs to trade in their SUV for a hybrid. It remains to be seen, however, just how high prices have to go until we actually see large numbers of alternatives on the road. 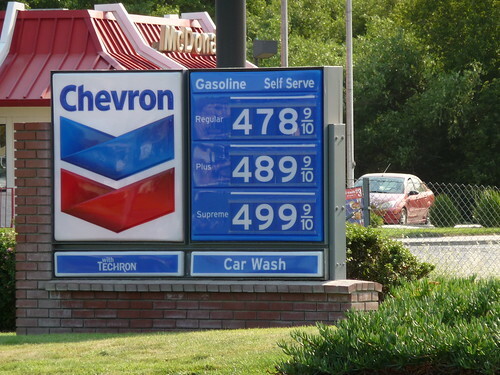 Read more: Will High Gas Prices Affect the Demand for Electric Cars? Sales for the range-extended Chevy Volt have been off to a rather slow start thus far in 2010, less than 1,000 so far, but General Motors remains optimistic that the Volt will sell well and may have plans to increase production this year and next. According to GM CEO Dan Akerson, production will increase on the Volt to 120,000 a year by the 2012 model build. That is a jump from the 10,000 originally planned for this year as well as the 45,000 to 60,000 once hoped for in 2012. Model S Alpha Hits the Road from Tesla Motors on Vimeo. Tesla Motors Model S has begun testing the Alpha model a few months ago and is set to continue refining this model before producing and testing the text Beta models later this year or next. Final production and delivery of the car is still scheduled for mid 2012 in North America. The first release of the Model S, stated to be around 1,000 cars, will be the unique Model S Signature Series. This first run should feature a 300-mile all-electric driving range and a host of luxury upgrades and treatments. The price for this 300-mile range car with the bigger battery pack is now figured to run around the $80,000 mark after the $7,500 Federal tax-credit is figured in. The next run of the car, coming out by the end of 2012, should allow for a choice between the long range car as well as a 160 and 230 mile range battery priced at about $50,000 and $60,000 (after credit) respectively.